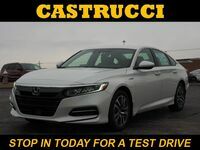 The 2015 Honda Accord Hybrid in Dayton, OH is a four-door sedan that gives you outstanding fuel economy and impressive interior features that offer both comfort and connectivity. Now in its second year, the Honda Accord Hybrid looks and drives just as well as the gasoline powered Accord but delivers much higher fuel economy ratings, which every driver will love. On the inside of the 2015 Honda Accord Hybrid you are treated to one of the best and most comfortable interiors of any sedan in its class. 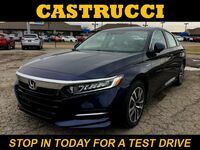 There is a reason why the Honda Accord is one of the best-selling vehicles in the world and it shows in this new hybrid in Dayton, OH. Now that we have it in stock, it's your turn to try out the 2015 Honda Accord Hybrid in Dayton, OH in person. Schedule a test drive today and experience the difference. Interested in a 2015 Honda Accord Hybrid? The 2015 Honda Accord Hybrid in Dayton, OH uses a 2.0-liter four-cylinder engine puts out 137 horsepower and an electric motor that serves as a generator to charge the Accord’s battery. A second electric motor that is used to power the Accord hybrid is fixed to the differential that sends power to the front-wheels drive system and it also uses a regenerative braking system to recharge the battery pack. The Honda Accord Hybrid offers three ways to drive your new sedan that all help to deliver maximum fuel efficiency. The EV Drive, Hybrid Drive and Engine Drive are all designed to provide you with the acceleration and highway efficiency you want and need in your new hybrid. When you start your search for a new Hybrid in Dayton, OH you want it to offer more than just excellent fuel economy, you also expect to find the some of the auto industry's most high-tech features and an interior that is spacious and comfortable. The new 2015 Accord Hybrid gives them all to you and even more. The 2015 Honda Accord Hybrid sits at the top of the Accord line up so you will be treated to the almost every feature that is offered on the top EX-L gasoline trim level. Standard and available options and features in the new 2015 Honda Accord Hybrid include adaptive cruise control, LED daytime running lights, rearview camera, Bluetooth, navigation system, steering-wheel mounted controls and tons of advanced safety features.